Polls will be open today from 6:00am to 9:00pm. Remember that you can't campaign inside of the polling places, and that this includes things like T-shirts, signs, and buttons in addition to trying to actively convert everyone around you. Everyone is now on the new machines, paper with an electronic scanner. In the primary, I noted that the marker they give you bleeds through the paper. They had folders to carry your ballot in, though, so I think it was sufficiently private. I still miss the old machines, though. Etna Fire Station - 26 Wood Road, Etna (map). Freeville Fire Station - 21 Union Street, Freeville (map). Dryden Fire Station - 26 North Street, Dryden (map). Varna Community Center - 943 Dryden Road, Varna (map). Bethel Grove Church Activity Center - 1749 Slaterville Road, Bethel Grove (map). Reach Out for Christ Church - 318 Johnson Road, Freeville (map). If you'd like to see a sample ballot before going in, the Board of Elections has them (PDF). There's a lot on there - maybe too much. Yes, it was mostly a bad night for Democratic candidates below the state level last night. Congressman Arcuri lost, as did Sheriff Meskill, though Assemblywoman Lifton won. I wish I'd updated the 2008 data for the last few weeks of registrations in the presidential race, as I suspect that a lot of those gains and losses happened then. If I compare that to May 2004, the earliest data I have, the shift toward Democratic registration is even clearer. How this all played out in Dryden will take a few more articles. I don't think this pattern favored either party much. The numbers will climb a bit through absentee ballots, but I don't except that to break through the 2006 turnout figure except maybe in Etna. Too many robocalls? Too many crazy television commercials? I'm pretty sure it wasn't too many signs this year. The crisp, cool days of autumn have arrived, bringing with them the yearning for treats fresh from the oven, which means its time for the Dryden Town Historical Society's famous annual home-made Pie and Bread Sale! This mouth-watering event will be held on Saturday, November 6th, in the lobby of the 1st National Bank of Dryden (West Main Street, Dryden) beginning at 9 AM. This sale is made possible by the efforts of our members who are among the finest bakers in the county. Come early for the best selection and don't count on finding so much as crumb left after 11:30. For more information, call Mary Hornbuckle (898-3461). If you're more interested in growing your food, the Dryden Community Garden has two end-of-season events Sunday. First, from 1:00pm to 3:00pm, a Putting The Garden To Bed day "to clean up the beds and paths, and to heap the vines etc. into a temporary compost pile. 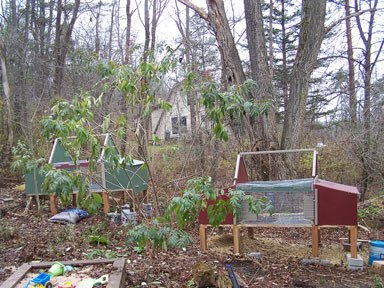 (A more formal compost system will be constructed next spring.)" After that, they'll be having a celebration of the garden from 4:00pm to 6:00pm at the Dryden Community Center Cafe. They not only built the garden this year, and had people using plots, but also harvested huge quantities of squash from the extra space that they donated to food pantries and dinners. To see what it looked like in summer, you can explore pictures I took earlier. It's good to see that Dryden Elementary School already got one of these, but hopefully other Dryden folks also have good ideas! When it comes to living in more sustainable communities, do small changes really add up? According to recent Neighborhood Mini-Grant recipients, the answer is yes! For only $4 per person, the Youth Farm Project was able to provide healthy ingredients for lunches, helping participants learn about nutrition from field to fork. 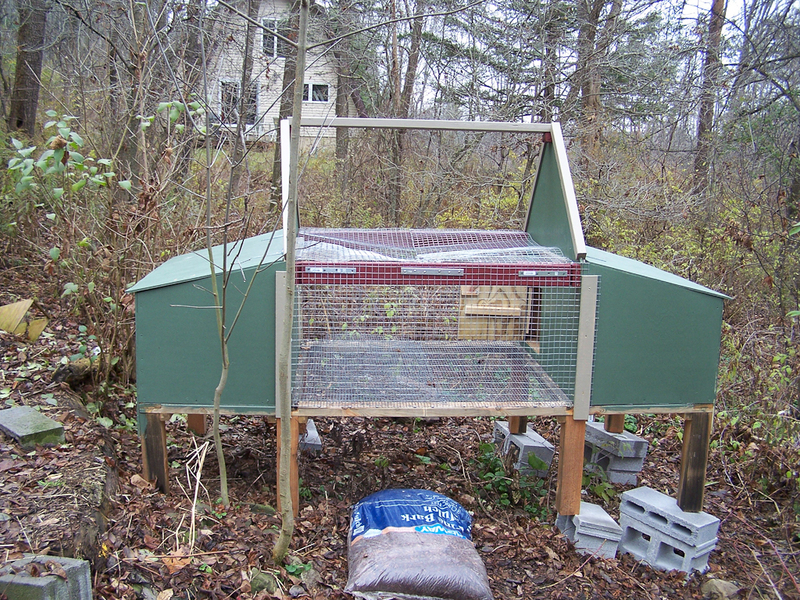 Students at Trumansburg Middle School had the space, vegetables, and technical know-how to build a root cellar; a Mini-Grant allowed them to purchase the materials to do so. Through another Neighborhood Mini-Grant, the Green Resource Hub helps local businesses and homeowners pinpoint areas of energy usage that can easily be reduced. Do you have an idea for a small change that could add up to big ideas in sustainability? If so, apply for a Neighborhood Mini-Grant from Sustainable Tompkins. Sustainable Tompkins is eager to support more projects like these and is calling on local citizens and grassroots groups to submit applications by December 1, 2010. Since 2008, Sustainable Tompkins has awarded over $17,000 in Neighborhood Mini-Grants that are shaping Tompkins County communities, encouraging local self-reliance, strengthening neighborhood connections, and promoting long-term community wellbeing. $400 to support the Watt Meter Lending Program organized through the Green Resource Hub. Finger Lakes home and business owners borrow Watt Meters, which measure the amount of electricity appliances and equipment use. Program participants can then conduct an electricity use inventory, and apply the results to achieve maximum savings. $600 to the Newfield Central School District to provide seeds, soil and materials for a new Food Development Lab and Composting Project. Students engage in growing food through indoor hydroponic garden grow carts with a complementary composting system. $600 to Ithaca Biodiesel Cooperative to support their campaign to increase public awareness of biodiesel and straight vegetable oil as fuel alternatives. Mini-Grant Funds will allow Ithaca Biodiesel to reach more potential customers and volunteers through traditional advertising venues. $600 to DIY Movie Making, The Eco-Musical, for the creation of a locally-produced film that will raise awareness about global and local issues of sustainability. $500 to Shared Grassroots Outreach Center to engage in a resource-sharing project with local non-profits and organizations, such as the Ithaca Freeskool. $400 to Dryden Elementary School Composting Project to reduce school and household waste and to create compost for family gardens. Sustainable Tompkins wishes to thank Danielle Klock and Wishing Well Magazine for their generous support, which has helped the Neighborhood Mini-Grants program continue to increase in scope and impact. Awards range from $150 to $750, and are made on a quarterly basis. Applications for the next round of grants are due on December 1, 2010 and all residents, citizen groups and non-profit organizations of Tompkins County are eligible to apply. To obtain an application form, make a donation in support of the program, or get more information, contact Nicole Pion: Nicole@sustainabletompkins.org or call (607) 216-1552. You can also find a lot more background in the Planning and Zoning category here. The Ithaca Journal hasn't published that much on Dryden lately, but I've been extra slack in posting it, so here's some catching up before the stories vanish. Some of the events in Cathy Wakeman's Dryden Town Talk have already happened, but there are both a dinner in Varna and an energy efficiency talk at the Dryden Fire Hall tonight. The piece on 16-year-old David Lampman's horticultural competition success and the news on bellringing aren't time-dependent, though. Criminal charges are not likely to be filed in the October 13th death of a William George Agency resident, though it doesn't sound like that's the end of the story. The Tompkins County Industrial Development Agency approved tax abatements for Cortland Produce to move into the former Ithaca Produce building on Johnson Road. This letter from Roger Yonkin reminds me of the strange deep square pothole in the shoulder of Route 366 heading west from the 13/366 overlap. It seems to keep growing. Finally, the County budget conversation still sounds a lot like it did in Dryden a couple of months ago. There will be a Veterans' Day commeration today at 11:00am at the Village Green in Dryden, between the Methodist and Presbyterian churches. I posted pictures of last year's event. A lot of people come, and maybe you can too. Why is the proposed Commercial zone a cancer? I used some fairly harsh words about the proposed Commercial zone last night - 'wretched' and 'cancerous' being the ones I most remember. Why would I have such a problem with a zone we obviously need? The basic question, I think, is simple: does it make sense to combine two major traffic generators along a series of key arterial roads? My answer is no, but there's a lot more to it. Commercial zones thrive on traffic, as businesses want to be in places where there's lots of traffic. I wrote earlier that "business comes from the road" here, and I still think that's true. Retail businesses want to be where they can be seen, which is mostly along 13 and 366. They generate traffic, but also benefit from existing traffic. Residential zones generally prefer to hide from traffic. High traffic volumes are intimidating and disruptive, but residential zones also generate substantial traffic. In particular, they generate traffic at the times when roads are busiest, the commuter rush hours. Yes, shared driveways, minimized curb cuts, and pushing access to side roads can reduce the number of intersection points, but those points have much higher intensity and may require extra lanes and traffic lights to function safely. The proposed "Commercial" zone combines commercial uses with the densest allowed residential development in the town. While it's sort of a "mixed use" zone, it does nothing to specify mixed uses of the kind where commercial and residential development support and reinforce each other. This won't help the Town's primary transportation corridors flow smoothly, and it pushes what higher density development we build along the roadside, which just isn't a fun place to live. There's a lot more to this - interactions with water and sewer infrastructure, incompatible uses, setbacks, farm protection, design guidelines, public transportation, and the ways "mixed use" can actually work - but this is the core of why I think this is an extremely bad idea. The Ithaca Journal had a nice piece on the expansion of the Southworth Library, and posted a photo gallery of the current state of things. There's also an article on last night's zoning conversation. It starts by focusing in on the sound regulation that came up at the end of the meeting, which is meant to target continuous or regular noise, like compressors used in natural gas extraction. It also looks at the broader conversation, pointing to discussion of the Commercial zone and the addition of a Neighborhood Residential zone. When they post the latest draft, I'll update my comparison charts, but in general the Neighborhood Residential is more restrictive residence-only zoning for established neighborhoods, while Rural Residential becomes a more flexible zone. I'm very very pleased to see that change. The other feature of last night's meeting that's worth pointing out is that attendance continues to climb. The September meeting had just me and a reporter from the Journal in the audience. October had six or seven, while last night had twelve to fifteen (depending on whether you count Participation in Government students visiting). There was also much freer conversation last night, and not just about definitions and details. The appeal and amendment processes got some discussion as well as the missions of zones described above. The next zoning discussion will be at the Town Board's December 8th meeting. There was also a one-car rollover on Route 13 between Lower Creek and 366. The driver was hospitalized. Are traffic lights on 13 inevitable? Target #1 in my discussion of the proposed 'Commercial' zone has been traffic. The Dryden Town Historical Society has a great picture of the western intersection of Routes 13 and 366 when 'new' 13 had just opened. 366 had a stop sign, and that was all. No lights, just some signs. The eastern junction is still like that, though fortunately with a left-turn lane. I've heard talk since I first started listening to Varna residents of the likely need for a light at the 366 / Mount Pleasant / Freese Road intersection, with the 366 / Turkey Hill / Monkey Run / Forest Lane intersection a close second. Dangerous as those intersections are, though, I don't think they compare to 13 / Mineah / Kirk, 13 / Yellow Barn / Johnson, or 13 / Irish Settlement / George. Visibility is especially bad at the first of those, but various combinations of left and right turns make them all pretty random. 13 / Lower Creek isn't great, either, and just to the west of the town line I curse a lot at 13 and Brown Road. If I remember right - I haven't always been paying attention - the state widened the highway a lot in its last major rework of 13. You can pretty much get around cars making left turns, except at intersections where you suddenly find both a left and a right turn in progress. Making a left on to 13 at any of these intersections is an adventure. So will we get traffic lights, or maybe the recently fashionable traffic circle, at these intersections in the next decade or so, no matter what we do? My guess is no. Traffic lights aren't cheap, and they don't seem especially popular with through traffic. New York State has gotten a little friendlier about lowering speed limits, but I suspect that they still have their eye on overall traffic capacity, something that traffic lights usually don't help. Could we change that? Probably, if we come up with development that makes the traffic flow more clogged or more dangerous. I think the Department of Transportation can protect itself to some degree by limiting curb cuts - as they have on 13 between Warren Road and 366 - but they don't seem to have done much of that east of there. Kids can learn to juggle at the Dryden Community Center Cafe tomorrow from 2:00pm to 3:00pm. Tomorrow (Saturday), the Cornell Herpetological Society will be at the Varna Community Center from 2-4PM with live exhibits of amphibians and reptiles along with books, information, and a whole lot of interesting things. Everyone is welcome to come and enjoy an afternoon of learning, and watching the animals and talking with the students about habitat, conservation, and many other interesting things. I posted pictures of their previous visit in 2008. It's definitely fun! Housing density increased substantially to the east of Varna over the last few months, without so much as a zoning change, stormwater management considerations, water and sewer infrastructure improvements, or even a building permit. Each unit includes two sheltered areas, plus a common fenced area that can be easily split as population increases. The population has been pretty stable lately - these are a speculative project hoping for expansion. The residents seem pretty happy so far. 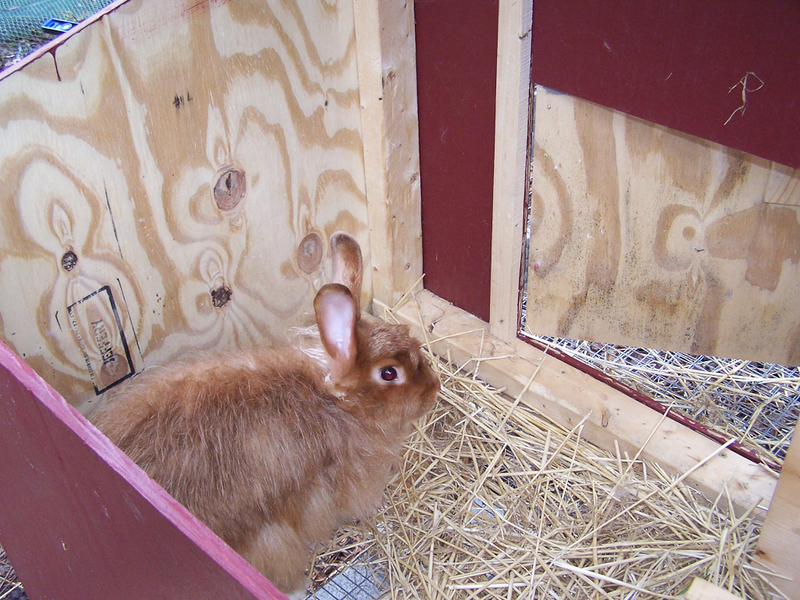 Rabbit housing isn't, of course, counted as dwelling units in Dryden zoning - it's just agricultural or accessory use. 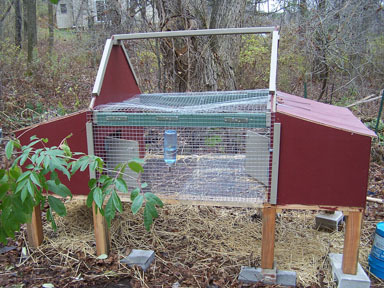 The cages are big, but not attached to the ground (and there are handles on them for when we need to move them around), so there's no building permit required either. 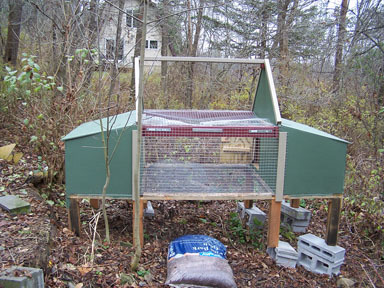 We do need to keep the cages clean, but material under the cages goes straight to the compost pile. 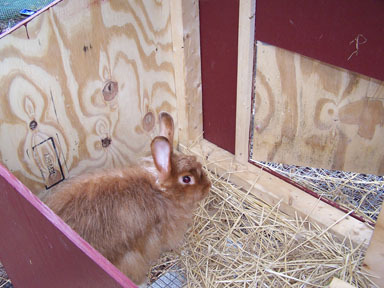 The rabbits are Angora rabbits, with fur that can be plucked and spun into wonderfully soft yarn. They're pretty gentle, though not entirely pets. Recapturing them if they escape is not a lot of fun, and hopefully this will give them lots of space without much opportunity to break out. There may be even greater density to come eventually, but this is hopefully enough for a while. They do echo other recent Dryden architecture to some extent, though I realized that after I built them. Fortunately, I like Artisan Construction's duplexes. The purpose of the Neighborhood Residential (NR) District is to define residentially developed areas of the town where established neighborhoods situated in a rural landscape constitute the primary land use. Single family homes are the predominant form of development, and future development in any way is unlikely. Home Occupations make up the only commercial activity in this district. Agriculture is allowed, but is generally infeasible to any large extent. The purpose of the Rural Residential (RR) District is to define an area of the town where residential uses situated in a rural landscape constitute the primary land use. Public water and sewer, does not exist and is not planned for this area. Single- and two-family homes are the predominant form of development. Agriculture is also expected to be a substantial land use well into the future. You can find a map of the new zones (5MB PDF) and updated portion of the proposed law (782KB PDF) at the Proposed Zoning Law Resources Page. As before, the old zoning districts don't correspond neatly with the new either. To figure out what's changing for a specific area, you need to visit the old map (image or PDF), and figure out what zone the parcel is in. Then you need to visit the new map (image or PDF) to see where it's going. Then you can figure out how allowed primary uses are changing there. The updated chart is below. Inn X SUP SUP SUP SUP P X X X SUP SUP P As motel? Bed-and-Breakfast home X SUP SUP SUP SUP SUP X X X SUP SUP ? "Tourist Homes?" Home Occupation: Level 2 X P on state/county roads, SUP on Town P - State & County Roads X X SUP P P X Two employee limit. Library X SUP X X SUP SUP X P P P P P 'Community building'? Religious institution X SUP SUP SUP SUP SUP SUP P P P P ? Warning: This is not a legal document. Do not use it to make decisions about what to do with your land! It is only meant for comparing the two laws, and may well be WRONG. If you find something wrong, please let me know in comments below. I just added Neighborhood Residential to the zone comparison chart, but how do the new (November) Neighborhood Residential and Rural Residential compare to the prior (July) Rural Residential? The table below lists all the uses and provides columns for the July Rural Residential and the November Neighborhood and Rural Residential. As you look down, you'll see that the new Neighborhood Residential is occasionally more restrictive than the old Rural Residential, while the new Rural Residential is generally less restrictive than the old Rural Residential. Warning: This is not a legal document. Do not use it to make decisions about what to do with your land! It is only meant for comparing the two proposed laws, and may well be WRONG. If you find something wrong, please let me know in comments below. This is huge (I think that's 144 units total), and I hadn't heard of it before now. Anyone know more about it? 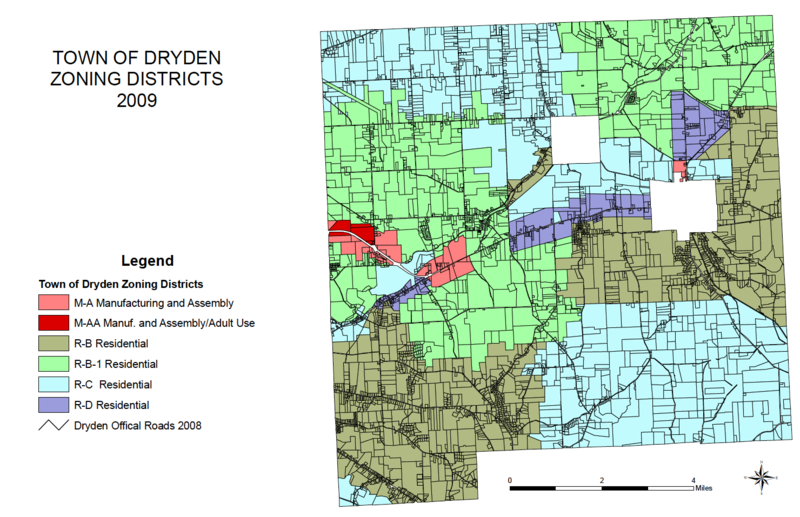 I just stumbled on it at the Village of Dryden website. The Village of Dryden Planning Board has scheduled Public Hearings for Thursday, December 2, 2010 at the Dryden Village Hall, 16 South St., Dryden. The purpose of the hearings is to review and take action on a proposed subdivision and site plan application for what is currently unimproved property situated at 111 Freeville Road/ Route 38, such development (entitled "Poets Landing") consisting of a total of 72 apartment units in 9 buildings, a community center, and a separate seniors housing building containing 72 living units. The project improvements include a private road network, private water and sewer infrastructure connected to the Village water and sewer systems, parking, landscaping and stormwater management facilities. The subdivision hearing will begin at 6:30 p.m. and the site plan hearing will begin at 7:00 p.m.
An 1890s water line runs from the Village of Dryden along North Road to the TC3 Head Start building, and its slow collapse is causing problems. Because it's outside of the village, the village can't repair it; because there's no water district, the Town of Dryden can't do anything either. There's long-term hope for a new water district around the village, but there's no way that can be done quickly. A letter informed the town residents the water would be cut off Dec. 29 FEBRUARY 28 [per comment below]. Mayor Randy Sterling told residents at the village board meeting Thursday that the Tompkins County Health Department considers the leaking pipes situation an emergency, which requires cutting off the water supply to prevent groundwater from possibly contaminating the whole system, and also saving the village money on costly repairs. "I'm concerned that four or five parcel owners who drill wells [now] will be out a lot of money if the water district happens in the future and we have to pay into it," [Mark Bell] said. There will be another meeting November 30th. In brighter news, the Finger Lakes Land Trust closed on 169 acres of land on Irish Settlement Road, including 6000 feet of frontage along Six Mile Creek. It borders both Hammond Hill and Yellow Barn State Forests. Other recent news includes the Dryden Animal Control Officer helping out in the Town of Ithaca, dog licenses moving from the state to municipalities (bad idea! ), comparisons of Halloween trick-or-treaters, and a Dryden woman sent to Drug Court. Oh, and Mike Arcuri says he won't run for Congress again. There will be a special Planning Board meeting on December 1st at the Varna Community Center to discuss the initial plan for creating a Varna Master Plan. The meeting will be at 7 pm. Just a reminder to any and all members of the Varna Community to come and participate in discussion on developing a master plan for the hamlet this coming Wednesday at 7 p.m. The Town Board has authorized funds to proceed with this planning process--issues to be focused on will be traffic controls, character of the community and much of what you contributed in a couple sessions last summer. This is your opportunity to shape the future of Varna for a more liveable community. This is open to anyone in the Varna community stretching from Game Farm to Rt 13 and including Turkey Hill, Monkey Run, Freese Rd and Forest Home Dr.
WHAT: A meeting to learn about the proposed community development plan for the hamlet of Varna. Previous plans developed by residents of Varna will be reviewed, and issues will be prioritized. Your input is needed! WHY: The Town Board has directed that a Master Plan be developed for the hamlet of Varna. WHO: Mike Welti, Certified Community Planner, Director of Planning Services at Behan Planning and Design, will lead the presentation and discussion. Mr. Welti is a consultant to the Town of Dryden. This conversation is happening because Varna residents weren't thrilled with the undifferentiated splotch of random development for the hamlet and proposed different approaches. The Planning Board, on reflection, agreed. If you live in or near the Village of Dryden, this meeting about the failing North Road water supply pipe might be worth a visit. It's at the Dryden Town Hall, 93 East Main Street (Route 392). Steve Lucente apparently didn't like the rejection the Town gave his application for a 260-unit development in Varna, and is appealing it to the the Town's Zoning Board of Appeals. They'll be meeting December 7th at 7:30pm at Dryden Town Hall, 93 East Main Street (Route 392) to discuss the appeal. I've also posted a summary of issues from Jim Skaley that I think is a good start toward explaining why approving this appeal would be a bad idea. My own immediate response to seeing the application was simpler - I don't think the sketch plan (page 12 of that PDF) is accurate. It's possible that they've completely reconfigured their building design, but where the old drawings showed around 200 boxes, this one only shows 150 by my count. Neither of those counts includes possible housing over the commercial piece of the development, but the friendlier picture of lower density in the appeal application doesn't seem very plausible to me. Let's hope Lucente's previous visits to the ZBA have at least convinced him that it would be a good idea to have taxes paid up when he visits. Dryden Daily KAZ has posted some hard questions about banning hydrofracking after reading a Dryden Resource Awareness Coalition petition. It's well worth reading - go read it before reading more of this. Yes, it is unfortunate that "the US really has no coherent energy policy, and NYS is basically corrupt." This has an effect that goes well beyond problems with incentives - it means that the shepherds do a lousy job of defending the sheep lately. The industries with the worst business records - energy, subprime lending, and similar cheerful things - shove the hardest against regulation of any kind, and they've gotten used to it being just a "cost of business". That situation makes me think we need government to push back harder against these folks, not just negotiate sort of kind of what we're allowed to beseech of their noble wealthy selves. On the more deeply cynical side, there's also a decent chance that this gold rush isn't what it's cracked up to be. Yes, I use natural gas for heating, water heating, and cooking. Living on 366, it was actually already here. I have pretty much zero control over where Iberdrola gets their gas, and haven't yet seen a provider offer environmentally more tolerable gas. The path to dealing with this isn't, however, worrying about "condemning small towns in Texas and Oklahoma and Louisiana to lives of unsightliness, disease, and misery" or thinking that "My own NIMBY attitude, if it is not accompanied by a refusal to use fossil fuels, is harmful to others." The way to deal with it is to use less, to focus on other fuel possibilities and reduce consumption. I cut my home's gas bill by 2/3 a few years ago, and I'm looking for ways to do that again. As much as I'd like to think a delegation of New Yorkers could convince Oklahomans that their views on oil and gas drilling aren't environmentally wise, there are some real limits to those possiblities. We have separate states for a reason, and one of those reasons is to make it possible to focus on our own back yards. Yep - power lines and phone lines are ugly. So are cell phone towers and roads and a lot of the strange environments humans build, old and new. I'd like to see huge changes in our expectations of what the world should look like - but to be honest, I don't think this has much of an impact on my views of hydrofracking. It's certainly a smaller visual impact than 100-meter wind farms. Yep. I live downhill from leased land. I do have city water, but appreciate my far cheaper well water for gardening and taking care of the animals. And 366 really doesn't need any more trucks. Yep. Pretty much all of the good jobs go to imported expertise, not to locals. From what I understand, it's largely specialty work. I did see the boost XtraMart on 366 got from the many contract workers NYSEG brought in to work on the powerline expansion to the Etna Substation, but it's not remotely clear that the local economic benefits outweigh the local economic costs. I'm not sure there's a nice way to deal with this. A petition that says "please allow fracking only under certain kind circumstances" just isn't going to have an impact, especially in the face of an industry with huge resources and a reputation for not really caring about its reputation. I signed the petition happily because I think this is what has to happen. New York State is a corrupt place that's only slightly held in check by the opinions of its electorate. State those opinions boldly at the Town level, where government is actually responsive to citizen input, and you might have some small chance of ending up in a better place. I know there are folks around here dreaming of windfall profits and shocked by their neighbors' resistance, but that's a hard conversation we need to have. Taking the time to have it might even ensure that those windfall profits are higher, in the event those of us who'd prefer to ban fracking lose. 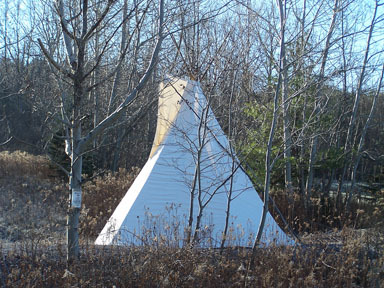 Does anyone know what's up with this teepee on the Route 13/366 overlap? I had thought the sign said "restricted area", like a Posted sign, but it seems to say "recreation area". I've been up in those woods once when we were looking at possible sites for an orchard (it didn't happen), and I know there are nicer sites a little ways up the hill. I'm guessing that like yurts, no building permit is required.